I've been introduced to a new product and I am in love! The texture of the Authentique paper makes doing projects a breeze!! 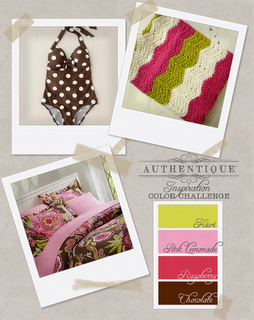 So, for my first Authentique color challenge I went with something I've never done before - tags! I have a gift for a friend and needed to make a card but instead I made this tag!! Today is the last day for the July challenge but I encourage you to do the August Color Challenge and Sketch challenge!! Click the icon below for a direct link back to the blog to play along! And here's my take on the project! The Authentique products I used were the following: Free Bird Series 1 Delight Theme item #s FBS112, FBS111, & FBS110 and the Free Bird Series 1 Fair-Weather Theme Item #FBS119. Other materials used are Stampin Up Elementary Elegance Sale-bra-tion stamp set, retired Stampin Up Painted Prints stamp set, SU pearls, SU twine, SU dazzling details and SU chocolate chip ink.